A couple of weeks ago on one of his routine visits to the fish market the husband bought plenty of fish to last us at least 3-4 weeks. We are predominantly seafood eaters and love experimenting with new recipes. This time’s prized catch was small sized mackerels as we don’t prefer eating king mackerels, the really big ones. To me they are tasteless and too meaty. The smaller ones which we usually get in Mangalore and in Mumbai (from Gujarat as the fisher woman used to claim) are tastier and have more delicate flesh. Since I thought I was not so great at making fish curries I had abandoned or rather delegated the task of making all kinds of seafood to Roshan and whatever he prepares is so tasty that we just don’t wait to click pictures instead we are literally waiting next to the pot of fish curry to scoop out some fish and splash its gravy generously on the pile of piping hot rice on our plates. 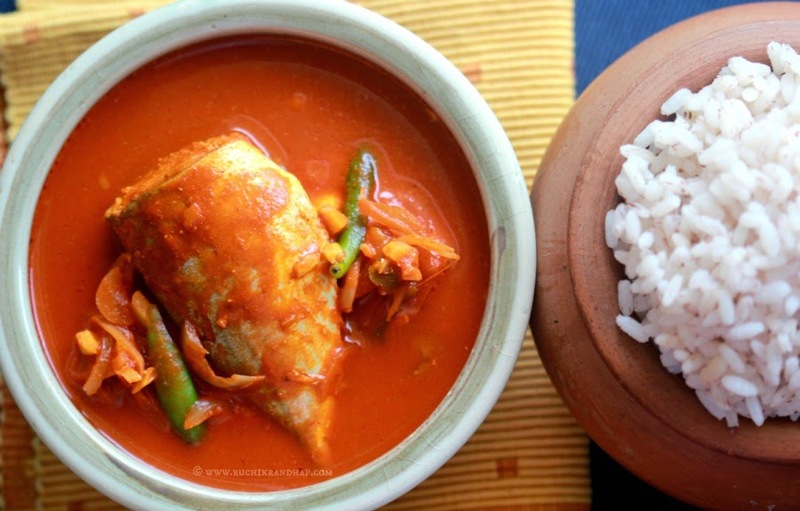 This particular type of fish curry was long due on my blog. Especially because I had made it several times before but had never written down the exact recipe. The mackerels lying in the fridge were a perfect reason to make this curry. ‘Shirko Shindaap’ technically means ‘Vinegar & Sliced Ingredients’ – that’s probably the direct translation of the Konkani term. However, a lot more goes into the curry paste – chillies, peppercorns, coriander and tamarind to name a few that give the curry its rich red colour, spice and tangy flavour. 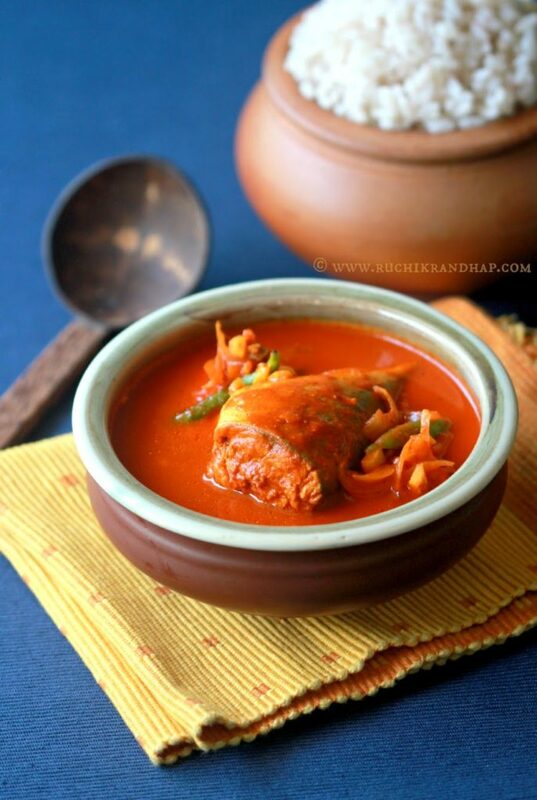 Mangalorean Catholic cuisine has a standard set of ingredients in the ‘shindaap’ – ginger, garlic, green chillies and onions. In this particular style of making the curry, these sliced ingredients are not fried in oil (although some people still do it). Instead they are simply tossed into the gravy and boiled to yield their flavours. The fish is then added and cooked to perfection. One must note that this typical curry among a few others doesn’t yield a lot of gravy. However this was ok in those days when people ate rice and fish curry for lunch and congee/kanji (rice porridge) for dinner with the leftover pieces of fish and so no gravy was necessary to finish their meal. In order to have a gravy that is sufficient in quantity yet not too spicy I have deseeded the chillies in the recipe. If you can manage the spice, go ahead and use whole chillies without deseeding them, adjust the quantities too if you wish. 1. Clean the fish well and cut them into 2 or 3 pieces depending on their size. Keep it aside. 2. Grind all the ingredients mentioned under ‘For the masala’ to a very fine paste. Tip: Grind the dry ingredients first in the dry grinding jar of your mixie and then add the wet ingredients. First transfer the ground masala into a wide based pan or kadhai (which you will use to cook the fish), then rinse the grinder with approximately 1 cup of water and add this to the pan. 3. Place the pan over a medium high heat. 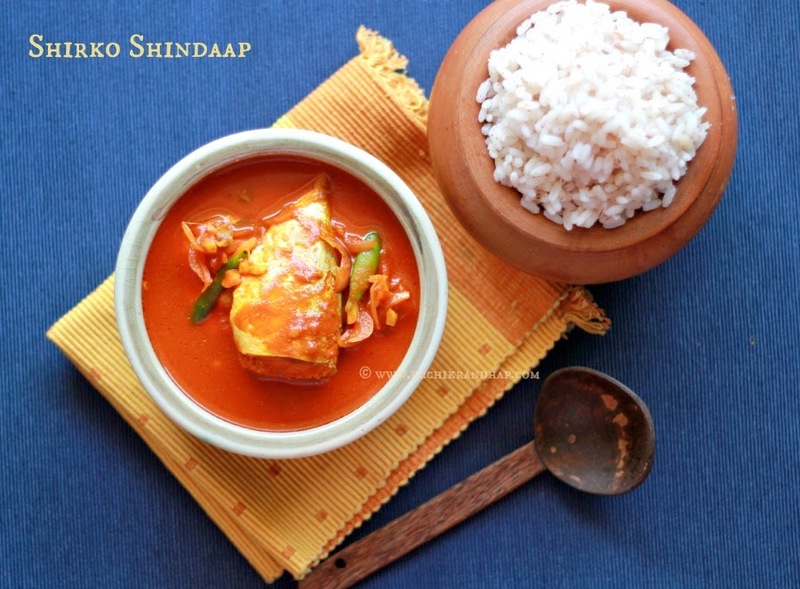 Add the ingredients mentioned under ‘For the shindaap’, vinegar, oil and salt to taste and bring the mixture to a boil. 4. When the mixture has come to a rolling boil, reduce the heat to medium low, add the fish gently taking care not to overcrowd the pan. Use a ladle to gently cover the fish with the gravy. Alternatively you can just shake the pan gently until all the fish is covered with the gravy. Cover the pan and simmer for approximately 2-3 minutes (time may vary depending on the size and variety of fish used) – do not overcook as fish normally continues to cook in its steam, long after you have turned off the heat. 1. In order to have a gravy that is sufficient in quantity yet not too spicy I have deseeded the chillies in the recipe. If you can manage the spice, go ahead and use whole chillies without deseeding them, adjust the quantities too if you wish. Thanks Shireen. 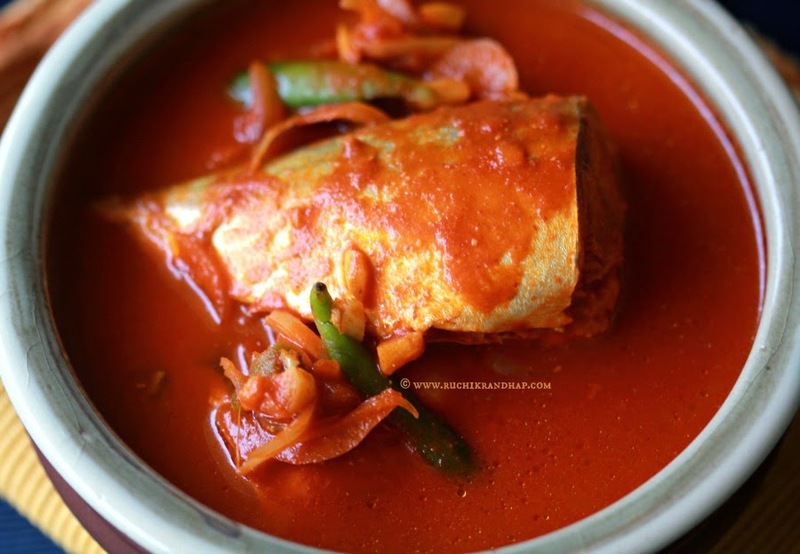 I don't eat much of fish curry but prefer fish fry.. but might try this out since my husband enjoys fish curry and I happen to have sardines at home. I only have kashmiri chillies will it make much difference to the taste? If possible do let me know. You've used my favorite fish and paired with rice , makes one amazing meal. Love the spicy red of the curry, absolutely delicious!! @ Michelle: Sorry for the delay in responding, there was some problem with my website and I totally missed seeing your comment. I hope this is not too late but yes, if you don;t have the Bedgi variety of chillies you may use Kashmiri chillies too! Hope you are able to make this curry soon!